Replacement:COM-10969. Our fancy new branded resistor kit still comes with plenty of resistors and it's also printed with resistor color code charts to help you pick just the part you need. This page is for reference only. 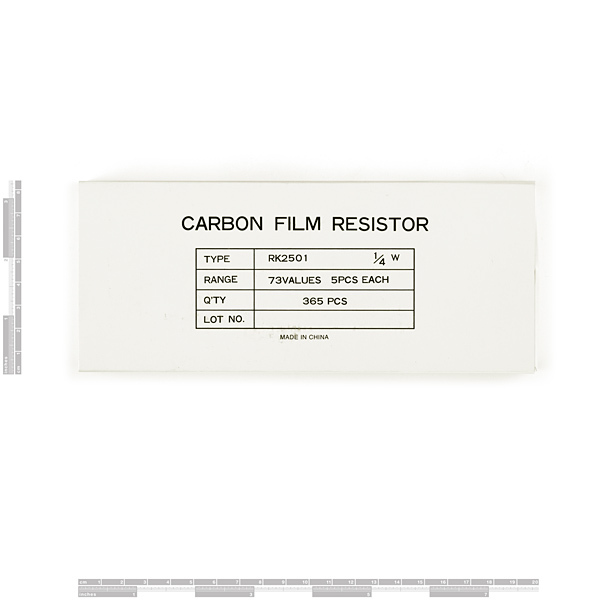 1/4th Watt, +/- 5% tolerance carbon film PTH resistors. 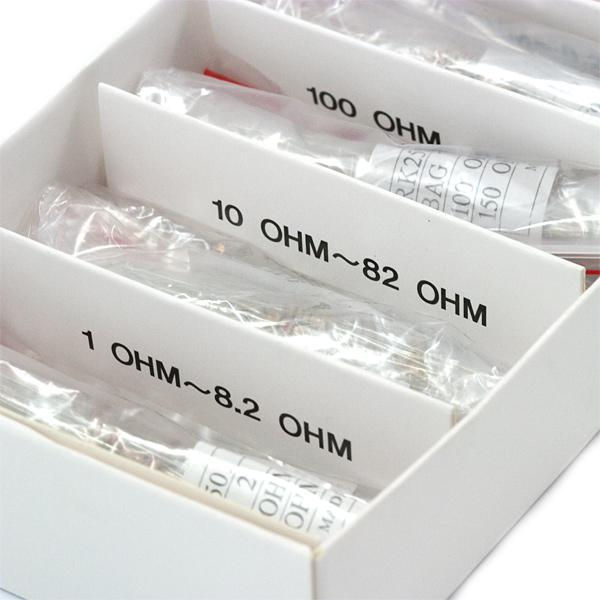 Commonly used in breadboards and perf boards. 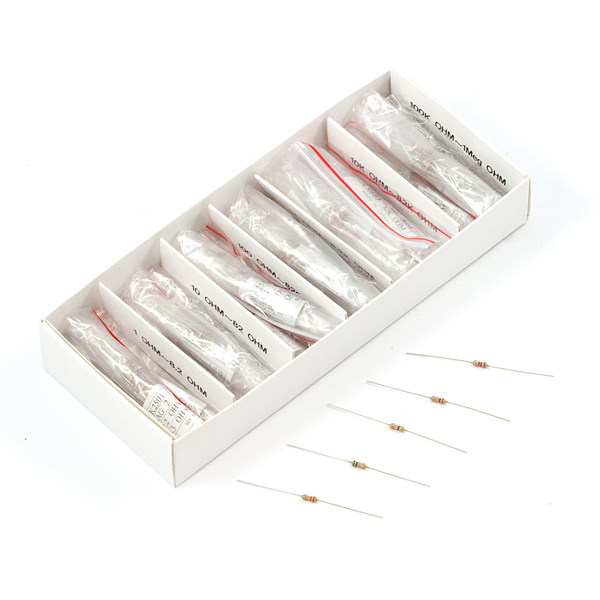 This wide assortment of resistors makes a great gift for beginner and advanced electronics nerds! For more gift ideas check out the SparkFun Gift Guide! Just though I'd point out that there are 73 different values listed, so this kit appears to contain 365 resistors in total (one for every day of the year!). That works out to just 3? each. Get one of this kit and you'll have a few of every value you are likely to need. Then get a 100 pack of each of the most common values (like 10K for pull-ups and ~200 ohm for current limiting) and you'll have all your prototyping resistor needs met. From the picture, it looked like it had a nice case and such for holding the resistors. Just to clarify: It's a decent "case" but you must note that it is just cardboard, not plastic like I expected. I went to walmart and bought a small double sided tacklebox with 6 compartments on each side. Cut the labels out of the cardboard box and tape them to the inside of the lid. Fits like a glove. Also has plenty of space on the other side for other components. This is the same resistor kit I was given in my toolbox when I took a few classes at ITT Tech back in 2001. The cardboard flaps are nice because it helps you dig around. However, I moved everything from the cardboard box to an expanding pocket folder like this one: http://www.officedepot.com/a/products/477072/Office-Depot-Brand-Poly-13-Pocket/ Wal-Mart has a cheaper one that is very sturdy, but I couldn't find it on their website. And I use this tackle box for component storage: http://www.walmart.com/ip/Plano-FTO-Elite-Extreme-Angle-R-System-with-Seven-Utilities-Blue-Beige/20563458 Last fall they were on sale for $49. I'm OCD when it comes to ESD protection...so each compartment is lined with aluminum foil and wired them to a grouding screw that I installed on the back of the tackle box. When will these be back? I REALLY need them for my project! There is a pretty good kit available on Amazon. Search for Joe Knows. Also I came up with a good way to organize my resistors. I use baseball card holders for a 3 ring binder. They have 9 pockets each and I just printed a label on each pocket. "Electronics NERD". I'm a Geek thank you very much. *Remember you can't spell Geek without the EE (Electrical Engineer)! Can I second everyone's comments who wanted more such kits? I would prefer the E96 series as I don't use carbon film in any of my designs (except as spacers or mounting posts or spare wire), and the cost of the metal film 1% resistors is bugger-all different to the 5% carbons. Plus, the 1/4 watt MF resistors handle well over 1/2 watts easily - so there's more room for mistakes/experimentation! and so on. Go on guys, go for it! I bought this expecting the range of resistors described above, however, the kit actually only contains 125 resistors. It comes with 5 each from 10K to 1M. These fit in the last two bins in the box. It does not come with any resistors below 10K. I recommend against buying this kit. It was likely a mistake. Call support. I copied a striping chart onto the outside of the box, sinc I'm not yet well versed in the colors. It would be handy if SparkFun were to print that! Generally, very convenient. Hate to burst y'all's bubble, but Velleman produces a pack of 610 resistors that I found for $8. 61 values, 10 of each value... that is about 1.3 CENTS each! Its sad they are out of stock. If you need these in a hurry like me, Digi-Key has them, for $4.00 more. Their PN is RS125ND. When I got my box of parts, my resistor kit was mising from the box. I gave Sparkfun a call, and they shipped one out to me the same day. An example of Sparkfun's great customer service! Who got a free resistor kit??? On an unrelated note, I had a dream last night that I had just made a HUGE order at SFE of transistors, resistors, etc., and they sent me 5 mini breadboards of every color and 2 games they don't even sell. So I had an argument with tech support because even though I lived in NY, he had some how looked at one of the games and found out that I had tried it to see if it was worth keeping. Then some other things happened and I woke up. I thought "Oooh, I hope this isn't some kinda omen!! That would be very bad!!!" Yea, a box with ten, and one of twenty would be great! I love the way that it's already sorted! Takes away a big headache not having to categorize them yourself. I agree with jandirks, a capacitor kit would be great too! This is something I've been waiting for for a long time! That would be expensive. Just order from Digikey. Order a sample kit from various capacitor companies, "Vishay" they will ship an assortment of caps, in a binder labelled and good to go. ditto and in various sizes please!